HMI stands for Human Machine Interface, a device that allows operators to control machinery using visual representations of the components in a given machine. Desktop computers have commonly been used for HMI systems, enabling easy interface and control via mouse and keyboard. More recently however, the term HMI has been used to more specifically describe touchscreen computer systems used for industrial and process control. 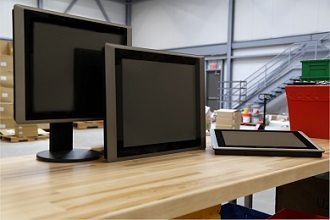 An HMI may be built using an all-in-one panel PC or created by combining a standalone computer and separate touchscreen display based on the needs of a given installation. HMI systems are most commonly deployed to control complex systems, frequently remotely, by relatively few operators. Manufacturing facilities of every kind have adopted HMI systems due to their reliability and ease of use. Because they frequently offer a visual representation of the system or systems being controlled, HMIs make training much easier and provide operators quick and intuitive insight into the status of equipment. HMIs can be employed in virtually any automation application, from access control and security, to inventory management and warehousing. With the proliferation of HMI technology has come a need for more and more advanced touchscreen systems. Today there are two primary touchscreen technologies being used in HMI applications. Capacitive Touchscreens use the human body's electrical field to process input, while Resistive Touchscreens rely on physical pressure to transmit touch data. Both systems have their pros and cons, so it's important to understand where each excels when building an HMI system.